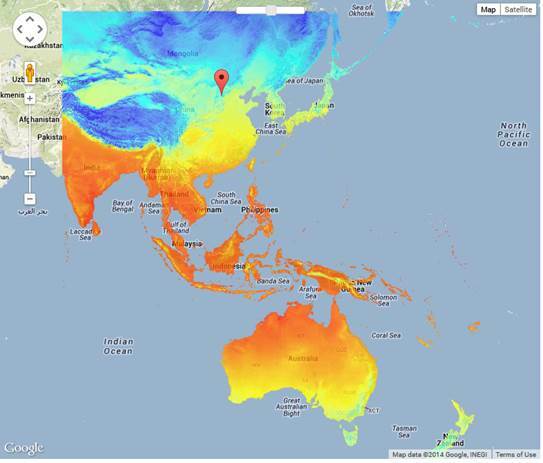 ClimateAP_Map is a Google map based version of the standalone MS WindowsÒ ClimateAP v1.00. It extracts and downscales PRISM (Daly et al. 2002) and ANUSPLINE 1961-1990 monthly normal data (2.5 x 2.5 arcmin) to scale-free point data and calculates seasonal and annual climate variables for specific locations based on latitude, longitude and elevation (optional). The coverage of ClimateAP includes most part of the Asia Pacific region (Figure 1). The program uses the scale-free data as baseline in combination with monthly anomaly data of individual years to downscale (“Delta method”) and calculate historical monthly, seasonal and annual climate variables for individual years and periods (decadal and normal periods) for 1901 - 2012. The monthly anomaly data were calculated based the dataset from Climate Research Unit (CRU) (Mitchell and Jones 2005) (version ts3.21). A time-series function allows users to obtain climate data for multiple years in a single run. With the same approach, ClimateAP also downscales and integrates future climate datasets for 2020s (2011-2040), 2050s (2041-70) and 2080s (2071-2100) generated by various global circulation models from the IPCC Fifth Assessment (AR5). A time-series of annual projections is also available for the years between 2011-2100. The output of the program includes both directly calculated and derived climate variables. Downscaling of PRISM monthly data including bilinear interpolation and elevation adjustment, and calculations of climate variables and estimation of derived climate variables are described in Wang et al. (2012). For predictions of multiple locations and for more GCMs, we recommend you to download the standalone version at “http://climateap.forestry.ubc.ca/downloads/index.html”. 1. Obtain coordinates of a location by clicking on the map. The values of latitude, longitude and elevation are generated by Google Map geo-positioning system and Google Elevation Service. Alternatively, latitude, longitude and elevation can also be input manually. 2. Navigate the map with overlays to identify the locations of interest. 3. Include historical years and periods between 1901- 2012 and future periods (2020s, 2050s and 2080s). A large number of climate variables (see below) can be generated for either a historical period (a year or a period) or future periods with different climate change scenarios. 4. Save outputs for multiple locations to a file on your local computer. Please check the “Quick Tutorial”. EMT extreme minimum temperature over 30 years. For an individual year, the EMT is estimated for the 30-year normal period where the individual year is centred. EXT extreme maximum temperature over 30 years. For an individual year, the EXT is estimated for the 30-year normal period where the individual year is centred. Funding for this study was provided by the APFNet (www.apfnet.cn).